For other things called "mercury", see Mercury (disambiguation). Mercury is a chemical element with symbol Hg and atomic number 80. It is commonly known as quicksilver and was formerly named hydrargyrum (/haɪˈdrɑːrdʒərəm/ hy-DRAR-jər-əm). 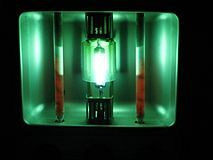 A heavy, silvery d-block element, mercury is the only metallic element that is liquid at standard conditions for temperature and pressure; the only other element that is liquid under these conditions is the halogen bromine, though metals such as caesium, gallium, and rubidium melt just above room temperature. The stability of the 6s shell is due to the presence of a filled 4f shell. An f shell poorly screens the nuclear charge that increases the attractive Coulomb interaction of the 6s shell and the nucleus (see lanthanide contraction). The absence of a filled inner f shell is the reason for the somewhat higher melting temperature of cadmium and zinc, although both these metals still melt easily and, in addition, have unusually low boiling points. Mercury dissolves many metals such as gold and silver to form amalgams. Iron is an exception, and iron flasks have traditionally been used to trade mercury. 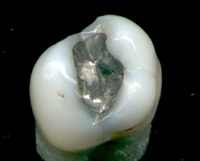 Several other first row transition metals with the exception of manganese, copper and zinc are also resistant in forming amalgams. Other elements that do not readily form amalgams with mercury include platinum. Sodium amalgam is a common reducing agent in organic synthesis, and is also used in high-pressure sodium lamps. Hg are the most often studied NMR-active nuclei, having spins of ​1⁄2 and ​3⁄2 respectively. In China and Tibet, mercury use was thought to prolong life, heal fractures, and maintain generally good health, although it is now known that exposure to mercury vapor leads to serious adverse health effects. The first emperor of China, Qín Shǐ Huáng Dì—allegedly buried in a tomb that contained rivers of flowing mercury on a model of the land he ruled, representative of the rivers of China—was killed by drinking a mercury and powdered jade mixture formulated by Qin alchemists (causing liver failure, mercury poisoning, and brain death) who intended to give him eternal life. Khumarawayh ibn Ahmad ibn Tulun, the second Tulunid ruler of Egypt (r. 884–896), known for his extravagance and profligacy, reportedly built a basin filled with mercury, on which he would lie on top of air-filled cushions and be rocked to sleep. The ancient Greeks used cinnabar (mercury sulfide) in ointments; the ancient Egyptians and the Romans used it in cosmetics. In Lamanai, once a major city of the Maya civilization, a pool of mercury was found under a marker in a Mesoamerican ballcourt. By 500 BC mercury was used to make amalgams (Medieval Latin amalgama, "alloy of mercury") with other metals. Mercury is an extremely rare element in Earth's crust, having an average crustal abundance by mass of only 0.08 parts per million (ppm). Because it does not blend geochemically with those elements that constitute the majority of the crustal mass, mercury ores can be extraordinarily concentrated considering the element's abundance in ordinary rock. 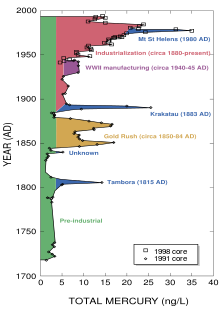 The richest mercury ores contain up to 2.5% mercury by mass, and even the leanest concentrated deposits are at least 0.1% mercury (12,000 times average crustal abundance). It is found either as a native metal (rare) or in cinnabar, metacinnabar, corderoite, livingstonite and other minerals, with cinnabar (HgS) being the most common ore. Mercury ores usually occur in very young orogenic belts where rocks of high density are forced to the crust of Earth, often in hot springs or other volcanic regions. Native mercury with cinnabar, Socrates mine, Sonoma County, California. Cinnabar sometimes alters to native mercury in the oxidized zone of mercury deposits. In 2005, China was the top producer of mercury with almost two-thirds global share followed by Kyrgyzstan. :47 Several other countries are believed to have unrecorded production of mercury from copper electrowinning processes and by recovery from effluents. Mercury exists in two oxidation states, I and II. Despite claims otherwise, Hg(III) and Hg(IV) compounds remain unknown. and elemental mercury. Mercury(I) chloride, a colorless solid also known as calomel, is really the compound with the formula Hg2Cl2, with the connectivity Cl-Hg-Hg-Cl. 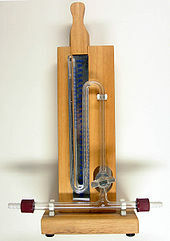 It is a standard in electrochemistry. It reacts with chlorine to give mercuric chloride, which resists further oxidation. Mercury(I) hydride, a colorless gas, has the formula HgH, containing no Hg-Hg bond. 4) is still occasionally used to test for ammonia owing to its tendency to form the deeply colored iodide salt of Millon's base. Organic mercury compounds are historically important but are of little industrial value in the western world. Mercury(II) salts are a rare example of simple metal complexes that react directly with aromatic rings. Organomercury compounds are always divalent and usually two-coordinate and linear geometry. Unlike organocadmium and organozinc compounds, organomercury compounds do not react with water. They usually have the formula HgR2, which are often volatile, or HgRX, which are often solids, where R is aryl or alkyl and X is usually halide or acetate. Methylmercury, a generic term for compounds with the formula CH3HgX, is a dangerous family of compounds that are often found in polluted water. They arise by a process known as biomethylation. Chlorine is produced from sodium chloride (common salt, NaCl) using electrolysis to separate the metallic sodium from the chlorine gas. Usually the salt is dissolved in water to produce a brine. By-products of any such chloralkali process are hydrogen (H2) and sodium hydroxide (NaOH), which is commonly called caustic soda or lye. 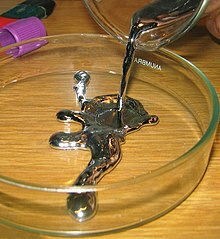 By far the largest use of mercury in the late 20th century was in the mercury cell process (also called the Castner-Kellner process) where metallic sodium is formed as an amalgam at a cathode made from mercury; this sodium is then reacted with water to produce sodium hydroxide. Many of the industrial mercury releases of the 20th century came from this process, although modern plants claimed to be safe in this regard. After about 1985, all new chloralkali production facilities that were built in the United States used membrane cell or diaphragm cell technologies to produce chlorine. Some transit telescopes use a basin of mercury to form a flat and absolutely horizontal mirror, useful in determining an absolute vertical or perpendicular reference. Concave horizontal parabolic mirrors may be formed by rotating liquid mercury on a disk, the parabolic form of the liquid thus formed reflecting and focusing incident light. Such telescopes are cheaper than conventional large mirror telescopes by up to a factor of 100, but the mirror cannot be tilted and always points straight up. Mercury-containing compounds are also of use in the field of structural biology. Mercuric compounds such as mercury(II) chloride or potassium tetraiodomercurate(II) can be added to protein crystals in an effort to create heavy atom derivatives that can be used to solve the phase problem in X-ray crystallography via isomorphous replacement or anomalous scattering methods. The miniaturized Deep Space Atomic Clock is a linear ion-trap-based mercury ion clock, designed for precise and real-time radio navigation in deep space. The Deep Space Atomic Clock (DSAC) under development by the Jet Propulsion Laboratory utilises mercury in a linear ion-trap-based clock. The novel use of mercury allows very compact atomic clocks, with low energy requirements, and is therefore ideal for space probes and Mars missions. A Single-Pole, Single-Throw (SPST) mercury switch. Quantities of liquid mercury ranging from 90 to 600 grams (3.2 to 21.2 oz) have been recovered from elite Maya tombs (100-700AD) or ritual caches at six sites. This mercury may have been used in bowls as mirrors for divinatory purposes. Five of these date to the Classic Period of Maya civilization (c. 250–900) but one example predated this. Experimental mercury vapor turbines were installed to increase the efficiency of fossil-fuel electrical power plants. The South Meadow power plant in Hartford, CT employed mercury as its working fluid, in a binary configuration with a secondary water circuit, for a number of years starting in the late 1920s in a drive to improve plant efficiency. Several other plants were built, including the Schiller Station in Portsmouth, NH, which went online in 1950. The idea did not catch on industry-wide due to the weight and toxicity of mercury, as well as the advent of supercritical steam plants in later years. Mercury was a propellant for early ion engines in electric space propulsion systems. Advantages were mercury's high molecular weight, low ionization energy, low dual-ionization energy, high liquid density and liquid storability at room temperature. Disadvantages were concerns regarding environmental impact associated with ground testing and concerns about eventual cooling and condensation of some of the propellant on the spacecraft in long-duration operations. The first spaceflight to use electric propulsion was a mercury-fueled ion thruster developed by NASA Lewis and flown on the Space Electric Rocket Test "SERT-1" spacecraft launched by NASA at its Wallops Flight Facility in 1964. The SERT-1 flight was followed up by the SERT-2 flight in 1970. Mercury and caesium were preferred propellants for ion engines until Hughes Research Laboratory performed studies finding xenon gas to be a suitable replacement. Xenon is now the preferred propellant for ion engines as it has a high molecular weight, little or no reactivity due to its noble gas nature, and has a high liquid density under mild cryogenic storage. Mercury was once used as a gun barrel bore cleaner. Mercury and most of its compounds are extremely toxic and must be handled with care; in cases of spills involving mercury (such as from certain thermometers or fluorescent light bulbs), specific cleaning procedures are used to avoid exposure and contain the spill. Protocols call for physically merging smaller droplets on hard surfaces, combining them into a single larger pool for easier removal with an eyedropper, or for gently pushing the spill into a disposable container. Vacuum cleaners and brooms cause greater dispersal of the mercury and should not be used. 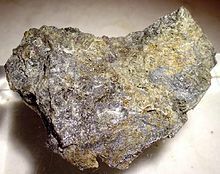 Afterwards, fine sulfur, zinc, or some other powder that readily forms an amalgam (alloy) with mercury at ordinary temperatures is sprinkled over the area before itself being collected and properly disposed of. Cleaning porous surfaces and clothing is not effective at removing all traces of mercury and it is therefore advised to discard these kinds of items should they be exposed to a mercury spill. A serious industrial disaster was the dumping of mercury compounds into Minamata Bay, Japan. It is estimated that over 3,000 people suffered various deformities, severe mercury poisoning symptoms or death from what became known as Minamata disease. Sediments within large urban-industrial estuaries act as an important sink for point source and diffuse mercury pollution within catchments. 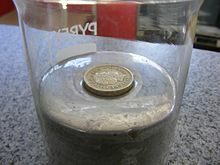 A 2015 study of foreshore sediments from the Thames estuary measured total mercury at 0.01 to 12.07 mg/kg with mean of 2.10 mg/kg and median of 0.85 mg/kg (n=351). The highest mercury concentrations were shown to occur in and around the city of London in association with fine grain muds and high total organic carbon content. The strong affinity of mercury for carbon rich sediments has also been observed in salt marsh sediments of the River Mersey mean of 2 mg/kg up to 5 mg/kg. These concentrations are far higher than those shown in salt marsh river creek sediments of New Jersey and mangroves of Southern China which exhibit low mercury concentrations of about 0.2 mg/kg. Toxic effects include damage to the brain, kidneys and lungs. Mercury poisoning can result in several diseases, including acrodynia (pink disease), Hunter-Russell syndrome, and Minamata disease. Symptoms typically include sensory impairment (vision, hearing, speech), disturbed sensation and a lack of coordination. The type and degree of symptoms exhibited depend upon the individual toxin, the dose, and the method and duration of exposure. Case–control studies have shown effects such as tremors, impaired cognitive skills, and sleep disturbance in workers with chronic exposure to mercury vapor even at low concentrations in the range 0.7–42 μg/m3. A study has shown that acute exposure (4–8 hours) to calculated elemental mercury levels of 1.1 to 44 mg/m3 resulted in chest pain, dyspnea, cough, hemoptysis, impairment of pulmonary function, and evidence of interstitial pneumonitis. Acute exposure to mercury vapor has been shown to result in profound central nervous system effects, including psychotic reactions characterized by delirium, hallucinations, and suicidal tendency. Occupational exposure has resulted in broad-ranging functional disturbance, including erethism, irritability, excitability, excessive shyness, and insomnia. With continuing exposure, a fine tremor develops and may escalate to violent muscular spasms. Tremor initially involves the hands and later spreads to the eyelids, lips, and tongue. Long-term, low-level exposure has been associated with more subtle symptoms of erethism, including fatigue, irritability, loss of memory, vivid dreams and depression. Fish and shellfish have a natural tendency to concentrate mercury in their bodies, often in the form of methylmercury, a highly toxic organic compound of mercury. Species of fish that are high on the food chain, such as shark, swordfish, king mackerel, bluefin tuna, albacore tuna, and tilefish contain higher concentrations of mercury than others. As mercury and methylmercury are fat soluble, they primarily accumulate in the viscera, although they are also found throughout the muscle tissue. When this fish is consumed by a predator, the mercury level is accumulated. Since fish are less efficient at depurating than accumulating methylmercury, fish-tissue concentrations increase over time. Thus species that are high on the food chain amass body burdens of mercury that can be ten times higher than the species they consume. This process is called biomagnification. Mercury poisoning happened this way in Minamata, Japan, now called Minamata disease. Norway enacted a total ban on the use of mercury in the manufacturing and import/export of mercury products, effective 1 January 2008. In 2002, several lakes in Norway were found to have a poor state of mercury pollution, with an excess of 1 µg/g of mercury in their sediment. In 2008, Norway's Minister of Environment Development Erik Solheim said: "Mercury is among the most dangerous environmental toxins. Satisfactory alternatives to Hg in products are available, and it is therefore fitting to induce a ban." Products containing mercury were banned in Sweden in 2009. ^ "Magnetic Susceptibility of the Elements And Inorganic Compounds" (PDF). www-d0.fnal.gov. Fermi National Accelerator Laboratory: DØ Experiment (lagacy document). Archived from the original (PDF) on 24 March 2004. Retrieved 18 February 2015. ^ "hydrargyrum" Archived 12 August 2014 at the Wayback Machine. Random House Webster's Unabridged Dictionary. ^ a b c d e f Hammond, C. R The Elements Archived 26 June 2008 at the Wayback Machine in Lide, D. R., ed. (2005). CRC Handbook of Chemistry and Physics (86th ed.). Boca Raton (FL): CRC Press. ISBN 0-8493-0486-5. ^ a b Senese, F. "Why is mercury a liquid at STP?". General Chemistry Online at Frostburg State University. Archived from the original on 4 April 2007. Retrieved 1 May 2007. ^ a b Norrby, L.J. (1991). "Why is mercury liquid? Or, why do relativistic effects not get into chemistry textbooks?". Journal of Chemical Education. 68 (2): 110. Bibcode:1991JChEd..68..110N. doi:10.1021/ed068p110. ^ "Dynamic Periodic Table". www.ptable.com. Archived from the original on 20 November 2016. Retrieved 22 November 2016. ^ Simons, E. N. (1968). Guide to Uncommon Metals. Frederick Muller. p. 111. ^ Gmelin, Leopold (1852). Hand book of chemistry. Cavendish Society. pp. 103 (Na), 110 (W), 122 (Zn), 128 (Fe), 247 (Au), 338 (Pt). Archived from the original on 9 May 2013. Retrieved 30 December 2012. ^ Soratur (2002). Essentials of Dental Materials. Jaypee Brothers Publishers. p. 14. ISBN 978-81-7179-989-3. Archived from the original on 3 June 2016. ^ Vargel, C.; Jacques, M.; Schmidt, M. P. (2004). Corrosion of Aluminium. Elsevier. p. 158. ISBN 9780080444956. ^ "Mercury and the environment — Basic facts". Environment Canada, Federal Government of Canada. 2004. Archived from the original on 16 September 2011. Retrieved 27 March 2008. ^ "Mercury — Element of the ancients". Center for Environmental Health Sciences, Dartmouth College. Archived from the original on 2 December 2012. Retrieved 9 April 2012. ^ "Qin Shihuang". Ministry of Culture, People's Republic of China. 2003. Archived from the original on 4 July 2008. Retrieved 27 March 2008. ^ Sobernheim, Moritz (1987). "Khumārawaih". In Houtsma, Martijn Theodoor (ed.). E.J. Brill's first encyclopaedia of Islam, 1913–1936, Volume IV: 'Itk–Kwaṭṭa. Leiden: BRILL. p. 973. ISBN 978-90-04-08265-6. Archived from the original on 3 June 2016. ^ a b Yuhas, Alan (24 April 2015). "Liquid mercury found under Mexican pyramid could lead to king's tomb". The Guardian. ISSN 0261-3077. Archived from the original on 1 December 2016. Retrieved 22 November 2016. ^ Pendergast, David M. (6 August 1982). "Ancient maya mercury". Science. 217 (4559): 533–535. Bibcode:1982Sci...217..533P. doi:10.1126/science.217.4559.533. PMID 17820542. ^ "Lamanai". Archived from the original on 11 June 2011. Retrieved 17 June 2011. ^ Eisler, R. (2006). Mercury hazards to living organisms. CRC Press. ISBN 978-0-8493-9212-2. ^ "Mercury Recycling in the United States in 2000" (PDF). USGS. Archived (PDF) from the original on 26 March 2009. Retrieved 7 July 2009. ^ Burkholder, M. & Johnson, L. (2008). Colonial Latin America. Oxford University Press. pp. 157–159. ISBN 978-0-19-504542-0. ^ Jamieson, R W (2000). Domestic Architecture and Power. Springer. p. 33. ISBN 978-0-306-46176-7. ^ Brooks, W. E. (2007). "Mercury" (PDF). U.S. Geological Survey. Archived (PDF) from the original on 27 May 2008. Retrieved 30 May 2008. ^ Hetherington, L. E.; Brown, T. J.; Benham, A. J.; Lusty, P. A. J.; Idoine, N. E. (2007). World mineral production: 2001–05 (PDF). Keyworth, Nottingham, UK: British Geological Survey (BGS), Natural Environment Research Council (NERC). ISBN 978-0-85272-592-4. Archived (PDF) from the original on 20 February 2019. Retrieved 20 February 2019. ^ About the Mercury Rule Archived 1 May 2012 at the Wayback Machine. Act.credoaction.com (21 December 2011). Retrieved on 30 December 2012. ^ a b Sheridan, M. (3 May 2009). "'Green' Lightbulbs Poison Workers: hundreds of factory staff are being made ill by mercury used in bulbs destined for the West". The Sunday Times (of London, UK). Archived from the original on 17 May 2009. ^ Boulland M (2006). New Almaden. Arcadia Publishing. p. 8. ISBN 978-0-7385-3131-1. ^ Wang, Xuefang; Andrews, Lester; Riedel, Sebastian; Kaupp, Martin (2007). "Mercury Is a Transition Metal: The First Experimental Evidence for HgF4". Angew. Chem. Int. Ed. 46 (44): 8371–8375. doi:10.1002/anie.200703710. PMID 17899620. ^ Riedel, S.; Kaupp, M. (2009). "The Highest Oxidation States of the Transition Metal Elements". Coordination Chemistry Reviews. 253 (5–6): 606–624. doi:10.1016/j.ccr.2008.07.014. ^ Henderson, W. (2000). Main group chemistry. Great Britain: Royal Society of Chemistry. p. 162. ISBN 978-0-85404-617-1. Archived from the original on 13 May 2016. ^ Rogalski, A (2000). Infrared detectors. CRC Press. p. 507. ISBN 978-90-5699-203-3. ^ National Research Council (U.S.) – Board on Environmental Studies and Toxicology (2000). Toxicological effects of methylmercury. National Academies Press. ISBN 978-0-309-07140-6. ^ Surmann, P; Zeyat, H (November 2005). "Voltammetric analysis using a self-renewable non-mercury electrode". Analytical and Bioanalytical Chemistry. 383 (6): 1009–13. doi:10.1007/s00216-005-0069-7. PMID 16228199. ^ "Merck's Manual 1899" (First ed.). Archived from the original on 24 August 2013. Retrieved 16 June 2013. ^ FDA. "Thimerosal in Vaccines". Archived from the original on 26 October 2006. Retrieved 25 October 2006. ^ Parker SK; Schwartz B; Todd J; Pickering LK (2004). "Thimerosal-containing vaccines and autistic spectrum disorder: a critical review of published original data". Pediatrics. 114 (3): 793–804. CiteSeerX 10.1.1.327.363. doi:10.1542/peds.2004-0434. PMID 15342856. Erratum Archived 13 August 2007 at the Wayback Machine (2005). Pediatrics 115 (1): 200. doi:10.1542/peds.2004-2402 PMID 15630018. ^ "Thimerosal in vaccines". Center for Biologics Evaluation and Research, U.S. Food and Drug Administration. 6 September 2007. Archived from the original on 29 September 2007. Retrieved 1 October 2007. ^ Liu J; Shi JZ; Yu LM; Goyer RA; Waalkes MP (2008). "Mercury in traditional medicines: is cinnabar toxicologically similar to common mercurials?". Exp. Biol. Med. (Maywood). 233 (7): 810–7. doi:10.3181/0712-MR-336. PMC 2755212. PMID 18445765. ^ "Two States Pass First-time Bans on Mercury Blood Pressure Devices". Health Care Without Harm. 2 June 2003. Archived from the original on 4 October 2011. Retrieved 1 May 2007. ^ "Title 21—Food and Drugs Chapter I—Food and Drug Administration Department of Health and Human Services Subchapter D—Drugs for Human Use Code of federal regulations". United States Food and Drug Administration. Archived from the original on 13 March 2007. Retrieved 1 May 2007. ^ a b Leopold, B. R. (2002). "Chapter 3: Manufacturing Processes Involving Mercury. Use and Release of Mercury in the United States" (PDF). National Risk Management Research Laboratory, Office of Research and Development, U.S. Environmental Protection Agency, Cincinnati, Ohio. Archived from the original (PDF) on 21 June 2007. Retrieved 1 May 2007. ^ "Chlorine Online Diagram of mercury cell process". Euro Chlor. Archived from the original on 2 September 2006. Retrieved 15 September 2006. ^ "Mercury Reduction Act of 2003". United States. Congress. Senate. Committee on Environment and Public Works. Retrieved 6 June 2009. ^ "Liquid-mirror telescope set to give stargazing a new spin". Govert Schilling. 14 March 2003. Archived from the original on 18 August 2003. Retrieved 11 October 2008. ^ Gibson, B. K. (1991). "Liquid Mirror Telescopes: History". Journal of the Royal Astronomical Society of Canada. 85: 158. Bibcode:1991JRASC..85..158G. ^ "Laval University Liquid mirrors and adaptive optics group". Archived from the original on 18 September 2011. Retrieved 24 June 2011. ^ Brans, Y W; Hay W W (1995). Physiological monitoring and instrument diagnosis in perinatal and neonatal medicine. CUP Archive. p. 175. ISBN 978-0-521-41951-2. ^ Zoski, Cynthia G. (7 February 2007). Handbook of Electrochemistry. Elsevier Science. ISBN 978-0-444-51958-0. ^ Kissinger, Peter; Heineman, William R. (23 January 1996). Laboratory Techniques in Electroanalytical Chemistry, Second Edition, Revised and Expanded (2nd ed.). CRC. ISBN 978-0-8247-9445-3. ^ Howatson A H (1965). "Chapter 8". An Introduction to Gas Discharges. Oxford: Pergamon Press. ISBN 978-0-08-020575-5. ^ Milo G E; Casto B C (1990). Transformation of human diploid fibroblasts. CRC Press. p. 104. ISBN 978-0-8493-4956-0. ^ Shionoya, S. (1999). Phosphor handbook. CRC Press. p. 363. ISBN 978-0-8493-7560-6. ^ Robert L. Tjoelker; et al. (2016). "Mercury Ion Clock for a NASA Technology Demonstration Mission". IEEE Transactions on Ultrasonics, Ferroelectrics, and Frequency Control. 63 (7): 1034–1043. doi:10.1109/TUFFC.2016.2543738. PMID 27019481. ^ "Mercury in your eye?". CIDPUSA. 16 February 2008. Archived from the original on 5 January 2010. Retrieved 20 December 2009. ^ McKelvey W; Jeffery N; Clark N; Kass D; Parsons PJ. 2010 (2011). "Population-Based Inorganic Mercury Biomonitoring and the Identification of Skin Care Products as a Source of Exposure in New York City". Environ Health Perspect. 119 (2): 203–9. doi:10.1289/ehp.1002396. PMC 3040607. PMID 20923743. ^ Healy, Paul F.; Blainey, Marc G. (2011). "Ancient Maya Mosaic Mirrors: Function, Symbolism, And Meaning". Ancient Mesoamerica. 22 (2): 229–244 (241). doi:10.1017/S0956536111000241. ^ Lew K (2008). Mercury. The Rosen Publishing Group. p. 10. ISBN 978-1-4042-1780-5. ^ Pearson L F (2003). Lighthouses. Osprey Publishing. p. 29. ISBN 978-0-7478-0556-4. ^ Ramanathan E. AIEEE Chemistry. Sura Books. p. 251. ISBN 978-81-7254-293-1. ^ Shelton, C (2004). Electrical Installations. Nelson Thornes. p. 260. ISBN 978-0-7487-7979-6. ^ Popular Science. 118. Bonnier Corporation. 1931. p. 40. ISSN 0161-7370. ^ Mueller, Grover C. (September 1929). Cheaper Power from Quicksilver. Popular Science. ^ Mercury as a Working Fluid. Museum of Retro Technology. 13 November 2008. Archived from the original on 21 February 2011. ^ Collier (1987). Introduction to Nuclear Power. Taylor & Francis. p. 64. ISBN 978-1-56032-682-3. ^ "Glenn Contributions to Deep Space 1". NASA. Archived from the original on 1 October 2009. Retrieved 7 July 2009. ^ "Electric space propulsion". Archived from the original on 30 May 2009. Retrieved 7 July 2009. ^ "IMERC Fact Sheet: Mercury Use in Batteries". Northeast Waste Management Officials' Association. January 2010. Archived from the original on 29 November 2012. Retrieved 20 June 2013. ^ Gray, T. (22 September 2004). "The Amazing Rusting Aluminum". Popular Science. Archived from the original on 20 July 2009. Retrieved 7 July 2009. ^ Dufault, Renee; Leblanc, Blaise; Schnoll, Roseanne; Cornett, Charles; Schweitzer, Laura; Wallinga, David; Hightower, Jane; Patrick, Lyn; Lukiw, Walter J. (2009). "Mercury from Chlor-alkali plants". Environmental Health. 8: 2. doi:10.1186/1476-069X-8-2. PMC 2637263. PMID 19171026. Archived from the original on 29 July 2012. ^ Francis, G. W. (1849). Chemical Experiments. D. Francis. p. 62. ^ Castles, WT; Kimball, VF (2005). Firearms and Their Use. Kessinger Publishing. p. 104. ISBN 978-1-4179-8957-7. ^ Lee, J.D. (1999). Concise Inorganic Chemistry. Wiley-Blackwell. ISBN 978-0-632-05293-6. ^ Waldron, HA (1983). "Did the Mad Hatter have mercury poisoning?". Br Med J (Clin Res Ed). 287 (6409): 1961. doi:10.1136/bmj.287.6409.1961. PMC 1550196. PMID 6418283. ^ Alpers, C. N.; Hunerlach, M. P.; May, J. Y.; Hothem, R. L. "Mercury Contamination from Historical Gold Mining in California". U.S. Geological Survey. Archived from the original on 22 February 2008. Retrieved 26 February 2008. ^ "Mercury amalgamation". Corrosion Doctors. Archived from the original on 19 May 2009. Retrieved 7 July 2009. ^ Pimple, K.D. Pedroni; J.A. Berdon, V. (9 July 2002). "Syphilis in history". Poynter Center for the Study of Ethics and American Institutions at Indiana University-Bloomington. Archived from the original on 16 February 2005. Retrieved 17 April 2005. ^ Mayell, H. (17 July 2007). "Did Mercury in "Little Blue Pills" Make Abraham Lincoln Erratic?". National Geographic News. Archived from the original on 22 May 2008. Retrieved 15 June 2008. ^ "What happened to Mercurochrome?". 23 July 2004. Archived from the original on 11 April 2009. Retrieved 7 July 2009. 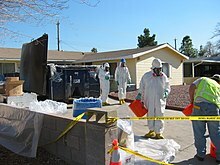 ^ "Mercury: Spills, Disposal and Site Cleanup". Environmental Protection Agency. Archived from the original on 13 May 2008. Retrieved 11 August 2007. ^ "Glacial Ice Cores Reveal A Record of Natural and Anthropogenic Atmospheric Mercury Deposition for the Last 270 Years". United States Geological Survey (USGS). Archived from the original on 4 July 2007. Retrieved 1 May 2007. ^ a b c Pacyna E G; Pacyna J M; Steenhuisen F; Wilson S (2006). "Global anthropogenic mercury emission inventory for 2000". Atmos Environ. 40 (22): 4048. Bibcode:2006AtmEn..40.4048P. doi:10.1016/j.atmosenv.2006.03.041. ^ "What is EPA doing about mercury air emissions?". United States Environmental Protection Agency (EPA). Archived from the original on 8 February 2007. Retrieved 1 May 2007. ^ Solnit, R. (September – October 2006). "Winged Mercury and the Golden Calf". Orion Magazine. Archived from the original on 5 October 2007. Retrieved 3 December 2007. ^ Maprani, Antu C.; Al, Tom A.; MacQuarrie, Kerry T.; Dalziel, John A.; Shaw, Sean A.; Yeats, Phillip A. (2005). "Determination of Mercury Evasion in a Contaminated Headwater Stream". Environmental Science & Technology. 39 (6): 1679. Bibcode:2005EnST...39.1679M. doi:10.1021/es048962j. ^ "Indoor Air Mercury" (PDF). newmoa.org. May 2003. Archived (PDF) from the original on 25 March 2009. Retrieved 7 July 2009. ^ "Mercury-containing Products". United States Environmental Protection Agency (EPA). Archived from the original on 12 February 2007. Retrieved 1 May 2007. ^ "Introduction". United States Department of Energy. Archived from the original on 8 July 2007. ^ "Minamata Disease The History and Measures". Ministry of the Environment, Government of Japan. Archived from the original on 24 June 2009. Retrieved 7 July 2009. ^ Dennis Normile (27 September 2013). "In Minamata, Mercury Still Divides". Science. 341 (6153): 1446–7. Bibcode:2013Sci...341.1446N. doi:10.1126/science.341.6153.1446. PMID 24072902. ^ a b c Vane, Christopher H.; Beriro, Darren J.; Turner, Grenville H. (2015). "Rise and fall of mercury (Hg) pollution in sediment cores of the Thames Estuary, London, UK". Earth and Environmental Science Transactions of the Royal Society of Edinburgh. 105 (4): 285–296. doi:10.1017/S1755691015000158. ISSN 1755-6910. ^ Vane, C.H. ; Jones, D.G. ; Lister, T.R. (2009). "Mercury contamination in surface sediments and sediment cores of the Mersey Estuary, UK". Marine Pollution Bulletin. 58 (6): 940–946. doi:10.1016/j.marpolbul.2009.03.006. ISSN 0025-326X. PMID 19356771. ^ Vane, C.H. ; Harrison, I.; Kim, A.W. ; Moss-Hayes, V.; Vickers, B.P. ; Horton, B.P. (2008). "Status of organic pollutants in surface sediments of Barnegat Bay-Little Egg Harbor Estuary, New Jersey, USA". Marine Pollution Bulletin. 56 (10): 1802–1808. doi:10.1016/j.marpolbul.2008.07.004. ISSN 0025-326X. PMID 18715597. ^ Vane, C.H. ; Harrison, I.; Kim, A.W. ; Moss-Hayes, V.; Vickers, B.P. ; Hong, K. (2009). "Organic and metal contamination in surface mangrove sediments of South China". Marine Pollution Bulletin. 58 (1): 134–144. doi:10.1016/j.marpolbul.2008.09.024. ISSN 0025-326X. PMID 18990413. ^ Ngim, CH; Foo, SC; Boey, K.W. ; Keyaratnam, J (1992). "Chronic neurobehavioral effects of elemental mercury in dentists". British Journal of Industrial Medicine. 49 (11): 782–90. doi:10.1136/oem.49.11.782. PMC 1039326. PMID 1463679. ^ Liang, Y. X.; Sun, R. K.; Sun, Y.; Chen, Z. Q.; Li, L. H. (1993). "Psychological effects of low exposure to mercury vapor: Application of computer-administered neurobehavioral evaluation system". Environmental Research. 60 (2): 320–7. Bibcode:1993ER.....60..320L. doi:10.1006/enrs.1993.1040. PMID 8472661. ^ McFarland, RB & Reigel, H (1978). "Chronic Mercury Poisoning from a Single Brief Exposure". J. Occup. Med. 20 (8): 532–4. doi:10.1097/00043764-197808000-00003. PMID 690736. ^ Bluhm, RE; et al. (1992). "Elemental Mercury Vapour Toxicity, Treatment, and Prognosis After Acute, Intensive Exposure in Chloralkali Plant Workers. Part I: History, Neuropsychological Findings and Chelator effects". Hum Exp Toxicol. 11 (3): 201–10. doi:10.1177/096032719201100308. PMID 1352115. ^ Bluhm, Re; Bobbitt, Rg; Welch, Lw; Wood, Aj; Bonfiglio, Jf; Sarzen, C; Heath, Aj; Branch, Ra (1992). "Elemental mercury vapour toxicity, treatment, and prognosis after acute, intensive exposure in chloralkali plant workers. Part I: History, neuropsychological findings and chelator effects". Human & Experimental Toxicology. 11 (3): 201–10. doi:10.1177/096032719201100308. PMID 1352115. ^ Cocoros, G.; Cahn, P. H.; Siler, W. (1973). "Mercury concentrations in fish, plankton and water from three Western Atlantic estuaries" (PDF). Journal of Fish Biology. 5 (6): 641–647. doi:10.1111/j.1095-8649.1973.tb04500.x. Archived from the original (PDF) on 11 February 2014. ^ "Minamata Convention Agreed by Nations". United Nations Environment Program. Archived from the original on 30 January 2013. Retrieved 19 January 2013. ^ Section, United Nations News Service (19 January 2013). "UN News — Governments at UN forum agree on legally-binding treaty to curb mercury pollution". UN News Service Section. Archived from the original on 16 October 2016. Retrieved 22 November 2016. ^ "Mercury: Laws and regulations". United States Environmental Protection Agency. 16 April 2008. Archived from the original on 13 May 2008. Retrieved 30 May 2008. ^ "Reductions in Mercury Emissions". International Joint Commission on the Great Lakes. Archived from the original on 28 August 2008. Retrieved 21 July 2008. ^ "Clean Air Mercury Rule". United States Environmental Protection Agency (EPA). Archived from the original on 30 June 2007. Retrieved 1 May 2007. ^ "State of New Jersey et al., Petitioners vs. Environmental Protection Agency (Case No. 05-1097)" (PDF). United States Court of Appeals for the District of Columbia Circuit. Argued 6 December 2007, Decided 8 February 2008. Archived (PDF) from the original on 3 February 2011. Retrieved 30 May 2008. ^ Mark S. Castro, John Sherwell, Effectiveness of Emission Controls to Reduce the Atmospheric Concentrations of Mercury. In: Environmental Science & Technology 49, 2015, 14000−14007, doi:10.1021/acs.est.5b03576. ^ "Oldest, dirtiest power plants told to clean up". Boston Globe. 22 December 2011. Archived from the original on 14 July 2014. Retrieved 2 January 2012. ^ Howard Berkes (10 November 2011). "EPA Regulations Give Kilns Permission To Pollute". NPR. Archived from the original on 17 November 2011. Retrieved 2 January 2012. ^ "Directive 2002/95/EC on the Restriction of the Use of Certain Hazardous Substances in Electrical and Electronic Equipment". 27 January 2003. Article 4 Paragraph 1. e.g. "Member States shall ensure that, from July 1, 2006, new electrical and electronic equipment put on the market does not contain lead, mercury, cadmium, hexavalent chromium, polybrominated biphenyls (PBB) or polybrominated diphenyl ethers (PBDE)." ^ "Mercury compounds in European Union". EIA Track. 2007. Archived from the original on 28 April 2008. Retrieved 30 May 2008. ^ Jones H. (10 July 2007). "EU bans mercury in barometers, thermometers". Reuters. Archived from the original on 3 January 2009. Retrieved 12 September 2017. ^ "Norway to ban mercury". EU Business. 21 December 2007. Archived from the original on 21 January 2008. Retrieved 30 May 2008. ^ Berg, T; Fjeld, E; Steinnes, E (2006). "Atmospheric mercury in Norway: contributions from different sources". The Science of the Total Environment. 368 (1): 3–9. Bibcode:2006ScTEn.368....3B. doi:10.1016/j.scitotenv.2005.09.059. PMID 16310836. Wikimedia Commons has media related to Mercury (element). Look up mercury in Wiktionary, the free dictionary.